One thing that becomes clear when you speak to people about their families is that our language has not kept pace with the modern fluidity of family forms; people can quickly become lost for words to define who constitutes their family. Making families � moral tales of parenting and step-parenting is a timely and insightful book as it begins to explore some of the meanings and everyday lives of this fluidity through step-families. Ribbens McCarthy, Edwards and Gillies provide an engaging account of the perceptions, expectations and experiences of step-families and parenting, examining accounts of parenting through heterosexual couples. The book explores how gender, generation and social class interplay with moral values about families, what they should be and what is expected of parents. The focus of the research is set within broader academic debates about the nature of the family in contemporary society which interplays with issues of risk, morality, democratisation and individualisation. As such, it investigates assumptions about the naturalness of family by contrasting 'normal' families with those made up of more than just blood relatives � step-families. The research has been undertaken through 46 in-depth interviews with 23 clusters of families, including absent biological parents. A small number of interviews were undertaken with the children within the step- families. The book is divided into six chapters: (1) Construction (step-) families � continuity or difference? ; (2) Being a 'family'; (3) Putting children first? : Adults, children and coupledom; (4) Doing Family': caring, authority and material provision; (5) 'It's just not fair!' The rights and obligations of 'doing family'; (6) Conclusions: difference, morality and democracy in (step-) families. 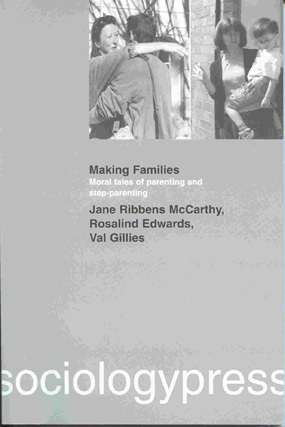 Ribbens McCarthy, Edwards and Gillies while acknowledging the small number of interviews found a tendency of middle class parents to focus on importance of blood ties in constituting the strongest family bond "biological parenthood as emotionally irreplaceable and non-replicable" (p134). Whereas in working class families, a stronger focus has been placed on the achieved aspects of parenting: "men who are prepared to act as provider and father to children are more significant and pertinent than biological fatherhood," (p134). While the book provides a strong sense of the variability of expectations and daily lives within step- families, perhaps more case studies would have allowed the reader a better appreciation of the findings through placing them on a contextual and biographical footing. While the accounts were engaging, I constantly wanted to know more about each family context. Does the absent 'biological' parent live nearby or play a strong role in their lives? Is there easy access or difficult negotiations for absent parent visits? How long has each step-family had been together as a unit and has the meaning of their (step- )family changed over time? Do they live in a traditional, rural or close-knit community or in a city, where step families may be more or less visible or viewed more or less intensively? However, perhaps this is their next project. Even without adding this, a more detailed table providing information about the families interviewed would have benefited the reader's comprehension of the research findings, all that we can glean from the existing table is a simple family form breakdown of the parents interviewed. However, these comments should not detract from what is an interesting and relevant book, which examines an important family grouping in contemporary society and raises questions about the current viability of existing sociological theories of the family.